This is one of the BEST fall recipes I’ve tried in a while, and first found it in Food Network Magazine. It’s a perfect way to mellow out kale greens, which are SO nutritious! We made this with roast chicken on the side and fresh grape tomatoes. There is a ton of kale, but if you have cooked with these kinds of greens, you know that they will wilt down A LOT, Just know they will all fit in your pan if you just give it a few minutes. If you added some white beans in at the end, I think it would make an amazing all-in-one vegetarian dinner. Priced at our local grocery store (Wegmans) this dish is $ 3.86 per person. Add in white beans for an all in one meal, and it’s a grand total of $4.05 per person! Not bad for a really nice, gourmet-style meal! Preheat broiler. In a large ovenproof skillet (with a lid), heat olive oil on the stove over medium heat and cook squash 5-10 minutes until soft and slightly browned. Add garlic, sage, red pepper flakes and cook another 2 minutes until garlic is soft. Add chicken broth to skillet and as it starts to simmer, add kale in batches until all are wilted slightly. Add gnocchi, stir well and cover for about 5 minutes until gnocchi is cooked through. Remove cover, and stir in 1/4 cup parmesan. Sprinkle remaining parmesan onto the top and put under the broiler for 2-3 minutes until bubbly and hot. This is a nice soft pasta for toddlers. 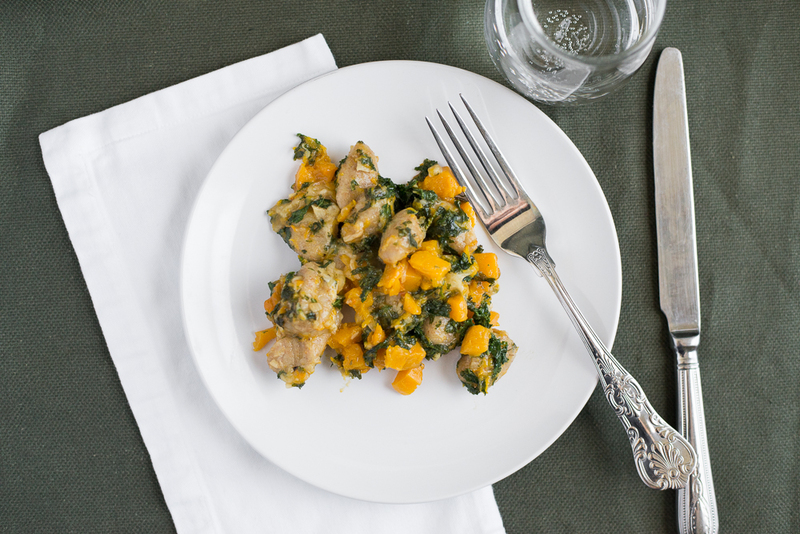 Consider cutting up the gnocchi and greens a bit for newer eaters. The squash is perfectly soft and can be pulled out and smashed up for even the newest eaters.